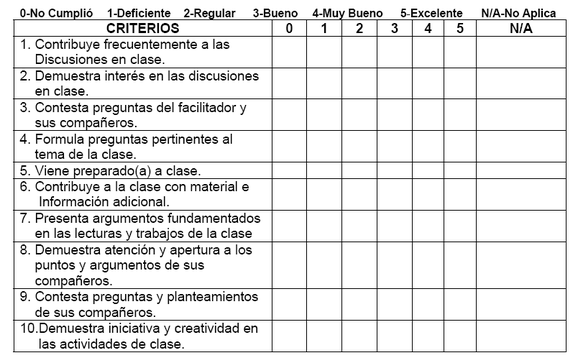 5- RESPONDE AL CRITERIO CON APROPIACIÓN ARGUMENTADO SUS RESPUESTAS. 13-CONTRIBUYE CON EL ASEO Y ORGANIZACIÓN DENTRO DEL AULA Y SU LUGAR DE TRABAJO. 14- NO SE RETIRA DEL AULA DE CLASE SIN AUTORIZACIÓN. 15-ESTA ATENTO ALAS EXPLICACIONES DEL DOCENTE. 17- APROVECHA EL TIEMPO DESIGNADO POR LA DOCENTE PARA REALIZAR LAS ACTIVIDADES DE CLASE. HACER UN RESUMEN SOBRE LOS SIGUIENTES CONCEPTOS Y ANALIZARLA RUBRICA QUE APARECE ABAJO PARA TALLERES.